09/10/2018 - Chicago and the 6* Medal! 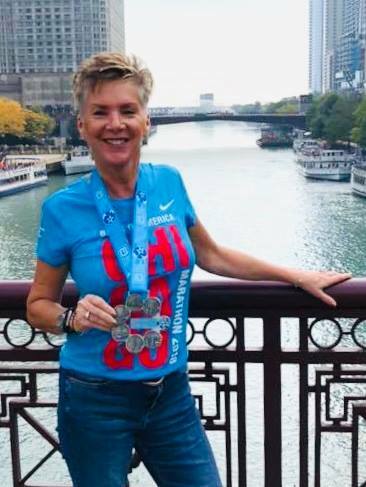 At the Chicago Marathon, Laura Graves had good reason to celebrate this weekend, by being the first Ivanhoe runner to claim the coveted Abbots Major 6 star medal. Awarded to her by Paula Radcliffe, the medal is for completing all 6 world Majors: London in 2014, Boston 2015, Tokyo and New York in 2016, then Berlin in September 2018, just 3 weeks before Chicago this Sunday. Throughout this time Laura has battled injury after injury, but kept coming back to do another marathon, and her determination and hard worked paid off, so she was thrilled to round off the last race at Chicago in 4:20. Andy Lindley, another serial marathoner, ran his 26th marathon also at Chicago, and was very happy to finish in 3:30 despite the jet lag!